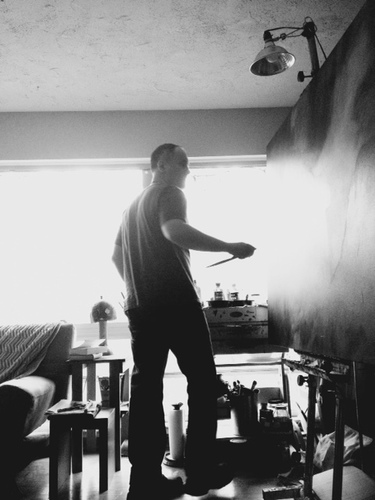 Robert Patricy is a visual artist who has been practicing professionally for 25 years. During his career Robert has shown works in galleries, museums and exhibitions both in America and abroad while also producing a number of larger scale mural commissions. While working as a graphic designer for an international architecture and design firmMr. Patricy worked on an array of diverse creative projects. Recently Robert’s art making has journeyed towards the contemplative and the sacred as subject matter while utilizing the tools and methods of traditional painting and recent digital technologies. His most recent endeavors include a Christ in Majesty mural for the dome of a private baptistry and design for gates depicting the Great Flood from Genesis. Robert lives with his wife Irmarie and works out of his home studio in Columbus, Ohio.